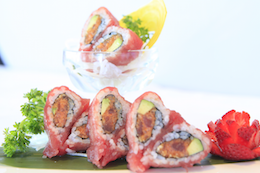 Yellowtail, eel, crab, avocado & tobiko w/spicy tuna on top and deep fried. Spicy crab, cucumber topped w/assorted fish & avoc. Eel, cucumber inside; avocado on top. Avocado, jalapeno roll deep fried, spicy scallop on top. 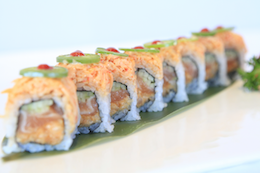 Spicy tuna, salmon, cucumber inside; spicy crab meat & jalapeno on top with chili sauce. 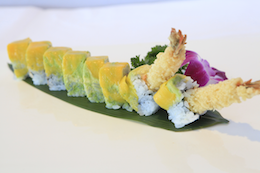 Soft shell crab tempura, spicy tuna, cucumber, avocado, mango wrapped with soy bean paper. Salmon, cilantro, mango inside; salmon on top. Served with special sauce. 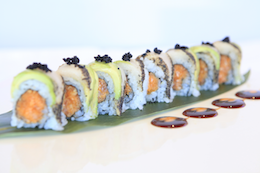 Spicy salmon, crunchies inside; topped w/lightly seared peppered white tuna, avocado, tobiko, chili sauce & wasabi mayo sauce. 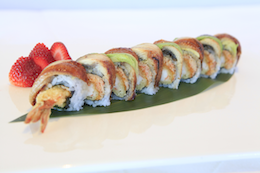 Shrimp tempura, spicy crab inside, topped with eel, avocado. 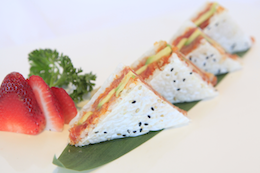 Shrimp tempura, papaya, spicy tuna, avocado inside; spicy crab meat, crunch on top with soy bean paper. Served with special sauce. 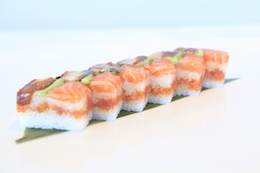 Spicy salmon, eel & cream cheese, jalapenos. Whole roll is deep-fried. 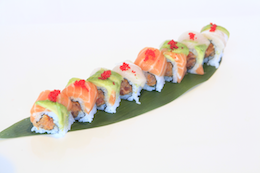 Spicy lobster, tuna, white tuna, crunch, avocado, mango with soy bean paper. 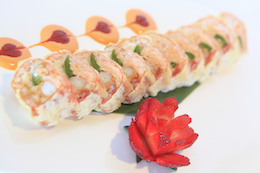 Shrimp tempura, spicy crab meat inside; mango & avocado on top. Deep fried asparagus & Kobe beef in soy paper. 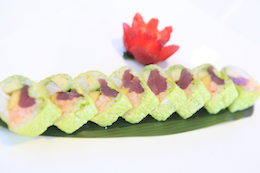 Soft shell crab inside, spicy tuna, avocado on top. 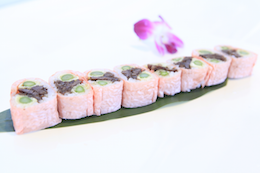 Shrimp tempura, avocado inside; kobe beef on top w/special sauce. 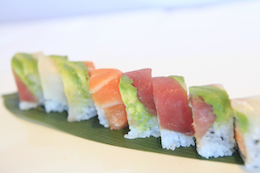 Spicy tuna, salmon, yellowtail, avocado and crunch wrapped w/ soy bean paper, served with special sauce. Snow crab, white tuna, spicy tuna, salmon, jalapeno wrapped with soy bean paper, lightly fried. 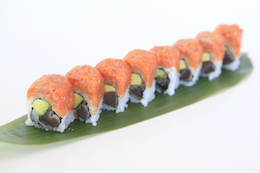 Spicy tuna topped with salmon, yellowtail, avocado, crunchies, tobiko. 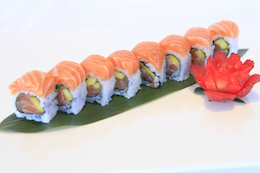 Spicy tuna topped with salmon, avocado and eel with eel sauce. Spicy salmon, spicy tuna and avocado wrapped with sesame soy paper served with spicy mayo and wasabi mayo. Egg, avocado, cucumber, pickled vegetable & oshiko. Shrimp tempura, cucumber, avocado, crab meat & lettuce. 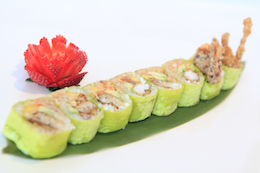 Soft shell crab, cucumber, avocado, crab meat & lettuce. 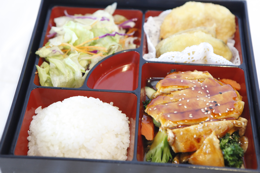 Chicken tempura, cucumber, avocado, crab meat & lettuce. 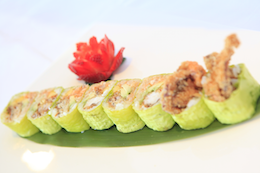 Lobster tempura, cucumber, avocado, crab meat & lettuce. Shrimp, spicy crab meat, cucumber. Spicy tuna, crunch & avocado wrapped with cucumber. 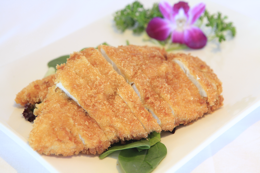 + These items may be served raw or undercooked, or contain raw or undercooked ingredients. Consuming raw or undercooked meats, poultry, seafood, shellfish, or eggs may increase your risk of foodborne illness.